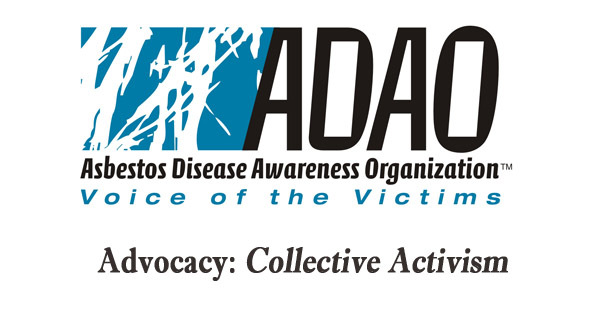 The Asbestos Disease Awareness Organization (ADAO) collaborates with various national and international organizations to promote public health and advocate for an end to asbestos use. 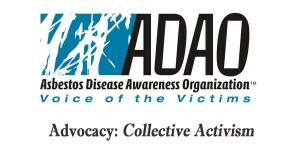 Each April, ADAO organizes an annual Global Asbestos Awareness Week, which was launched following our successful initiative to pass Senate Resolution 376, which designates the first week of April as “National Asbestos Awareness Week” in the U.S. Additionally, since 2004, ADAO has hosted several briefings for the House of Representatives, the Senate, and the White House. Read more about ADAO and Who We Are. How can you help to create a world free from asbestos and asbestos disease? Attend our 2019 Conference. “Where Knowledge and Action Unite,”April 5 – 7 ,2019. Share Your Story. Let us take your story to Washington, DC.  Tell us about how you or your loved one has been affected by asbestos-caused disease. Connect and Share educational materials. Most people don’t know that asbestos is still legal and lethal in the U.S. and don’t know how to protect themselves from exposure. Share this information on Facebook, LinkedIn, Twitter and your other social networks.